ABC Four Corners Interview with Simone Marsh, Senior environmental specialist, for GAS LEAK! Whistleblower Simone Marsh unpacks the startling evidence of how the Australian public was shortchanged by both Big Gas and Queensland Inc. The result is the present gas crisis and the recent, unprecedented move by the Federal Government to intervene in the market. This is a story of “revolving doors” between industry and government and influence peddling, a story which demands that whistleblowers be protected at all costs, and a story which demands that governments be accountable to the citizens who elect them. “Our whole industry loses out if gas is no longer seen as a reliable and available energy source, if we as producers are seen to be creating problems for the community rather than solving them. With skyrocketing domestic gas prices and a supply crisis, Australians are being hit hard. Even higher prices are to hit energy customers’ bills this winter. Coleman’s speech, however, failed to explain how with one of the world’s largest gas reserves, Australia managed to find itself in this sorry state. Seven years ago, an experimental (and particularly virulent) form of gas production and export was let loose on our eastern states with little regard for research, legal processes and limits. The result – today’s gas price crisis – was therefore preventable at every step of the way. Individuals at the top of industry and governments of both stripes are responsible. A full investigation is needed. In 2009, the Queensland Government published Blueprint for a proposed LNG industry “in light of the potential economic benefits to the state”. At that time, a “Gas Reservation Policy” and a “Prospective Gas Production Land Reserve” were to be considered to address the “real problem” of the prospective impact on the domestic gas market. By mid 2010, public servants evaluating technical parts of CSG-LNG proposals were told arrangements were underway, at senior government levels, to ensure production from certain project tenements would be directed to domestic supply. A percentage of total project production (10 per cent we were told) was to be reserved for domestic gas supply. However, no such protection measures eventuated. In March 2010, on a stage in Beijing, former Labor Federal Resources Minister Martin Ferguson facilitated the sale of Queensland’s gas on behalf of the UK’s BG Group to a Chinese government-owned corporation. At the time of the signing ceremony for the deal, BG Group’s subsidiary Queensland Gas Company (QGC) did not have approval to take the large gas resource. QGC’s Queensland Curtis LNG (QCLNG) project had not been through state or federal impact assessment and relevant petroleum tenements had not been granted. 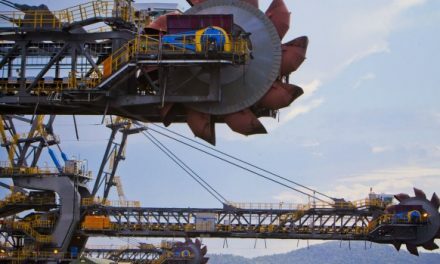 The terms of reference for projects for Santos GLNG and QGC QCLNG required a summary of “the economic costs and benefits to other industries and the wider community of Queensland and Australia”. There was no independent verification or audit statement for the claims made thereby providing no economic basis for government support. The projects were unjustified. The EIS process should have been stopped at this point, on the basis that the EIS failed to meet the terms of reference. However, the documents were released to the public for comments and the process continued. It does not appear that a proper cost-benefit analysis was undertaken prior to former Labor Federal Environment Minister Tony Burke issuing federal approvals, to CSG-LNG export proponents QGC and Santos, in October 2010. By this time, the Labor federal trade minister was Dr Craig Emerson, partner of Ferguson’s chief of staff and principal resources and energy advisor, Tracey Winters. In early 2011, Winters became QGC’s vice president environment. Following retirement from politics in 2013, Martin Ferguson was appointed to the global board of BG Group. Ferguson was later criticized for breaching ministerial ethics after becoming chairman of the advisory board of the gas lobby Australian Petroleum Production and Exploration Association (APPEA). 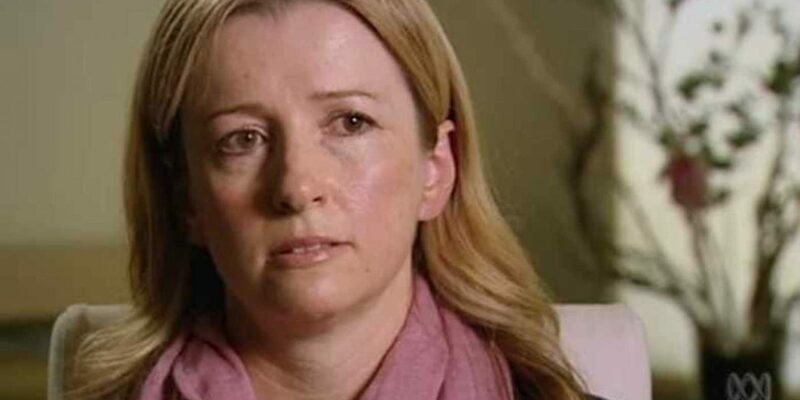 In April 2013, I gave an interview as a government whistleblower on ABC Four Corners “GasLeak!” program regarding the lack of proper impact assessments for the QCLNG and Santos GLNG export projects. Following the program, Winters appeared before a Senate Environment and Communications Legislation Committee on behalf of QGC. “She [Simone Marsh] was brought in after the assessment”. “Our submission was made to government with all of our studies in 2008”. However, the Coordinator-General timeline for QGC’s project proves Winters’ statements to be false and misleading. Similarly, documents obtained under Right to Information processes, and submitted (by myself) to a federal Senate inquiry in November 2014 also prove Winters’ statements to be false. On 12 May 2010, Ian Fletcher, fresh from his role as a director at UK Trade and Investment (now Department for International Trade), wrote an email to the Queensland Labor treasurer Andrew Fraser. Fletcher had been appointed the director-general of Fraser’s mega Queensland Department of Employment, Economic Development and Innovation (DEEDI). In the UK, Fletcher had worked with the Duke of York. Fletcher apparently kept the Prince’s portrait on his Brisbane desk. Coincidentally, the Prince had been present at the sale of Queensland’s gas few weeks prior. “The drop dead date really is the June board meeting… One or two weeks tidying up delay is possible, but six months (or anything like it) is not”. Rewind. A few weeks earlier, following legal advice, a letter had been sent to Santos. I included a draft copy of the letter in a Senate Inquiry submission in 2014. Santos was advised its GLNG EIS had not met legal requirements, hence could not be signed off by the Coordinator General. We now hear, via Fletcher, that QGC’s CSG-LNG export proposal was non-compliant with our laws. Whilst Andrew Fraser had zero authority to decide the impact assessment outcome, Colin Jensen and the then environment department director-general John Bradley, are copied in. As it happens, Fraser chaired the LNG cabinet sub-committee, formed in March 2010. The LNG committee, however, also had no legislated authority to decide the impact assessment outcome. In April 2013, ABC Four Corners GasLeak! reported it found 600 pages of documents supporting claims of improper process in relation to LNG approvals. However, Queensland’s corruption watchdog, Queensland Crime and Corruption Commission, claimed “no circumstances which would justify further investigation” were found. The watchdog did not release a signed report. Intriguingly, a series of disturbing events had occurred in February 2013, after evidence of improper process was given to the watchdog. The (CSG-conflicted) office of new LNP Premier Newman met the watchdog; then the Premier’s officers met the former QGC vice-president — the late Rob Millhouse. The watchdog’s chair, Ross Martin, and deputy, Warren Strange, left their positions soon after these meetings. In the wake of the controversy, Strange also quit — apparently not by choice. The director-general of the Premier’s department, Jon Grayson, was a part owner in a CSG services company at the time of the meetings. The other owner of the CSG business was Australian Water Queensland (AWQ), an arm of Australian Water Holdings (AWH). Liberal party fundraiser Nick Di Girolamo was a company director. Liberal MP Arthur Sinodinos testified (at NSW Independent Commission Against Corruption) that former Liberal Senator Santo Santoro had asked for a role at AWQ. Coincidentally, Martin Ferguson, John Pierce, Craig Emerson and Tony Burke are old boys from Sydney’s St Patrick’s College, as are Nick Di Girolamo and Eddie Obeid Jnr. Burke and Eddie Obeid Snr were once right faction allies in the NSW parliament. Essentially, a changing of the guard occurred in Queensland in mid 2013. The Courier-Mail (CM) first reported the lack of CSG-LNG assessment in February 2013. This article by journalist John McCarthy shows the newspaper obtained a copy of Fletcher’s email. For unknown reasons, the paper failed to print the words “constitutional innovation” and “Court of Star Chamber”. Oddly, John McCarthy’s brother, Mark McCarthy, was in charge of BG Group communications in the UK. Editors at the newspaper, David Fagan and Michael Crutcher, were axed in June 2013. I met Crutcher at a Kangaroo Point café in 2010. Crutcher attempted to obtain documents from government, without luck. News Limited’s national chief correspondent, Hedley Thomas, was candid when I asked him to investigate in 2013. He personally could not write the story; his wife worked for QGC and they socialised with (then company chief) Catherine Tanna. Thomas headed communications at QGC 2008-09 when its terms of reference and EIS were written. Former federal Labor minister Peter Garrett wrote in his memoir about the intense pressure applied to him to approve QGC and Santos’ projects, despite inadequate assessment; with former federal Labor treasurer Wayne Swan and minister Martin Ferguson “acutely focused on the decision”. Garrett did not give in, and was replaced by Tony Burke. After Burke approved CSG-LNG, Swan appointed Catherine Tanna to the board of the Reserve Bank of Australia. Penelope Wensley, Governor of Queensland during LNG-entry phase, then appointed Tanna to the board of the Commonwealth Games. Governor Wensley, Tanna and Andrew Liveris AO received Vice-Chancellor’s Alumni Excellence Awards from the University of Queensland. Andrew Liveris AO is the head of Dow Chemicals in the US and the brother-in-law of Tony Bellas. Dow Chemicals produce chemicals for the gas industry. A group of researchers discovered that Liveris and Bellas attended Brisbane State High, and Tony married Andrew’s sister, Maria. Bellas, among other past-and-present AWH and CSG industry interests, was Grayson’s business partner in the CSG wastewater business. The late Dr Ken Levy and former judge Stanley Jones arrived on the scene at the corruption watchdog the same week in May 2013. Jones was a land appeal court judge and Supreme Court judge at the time as Dr Levy had been director-general of the Department of Justice. In May 2013, Bellas was appointed head of Shine Lawyers (around the same time it listed on the ASX). Shine Lawyers started up in Toowoomba in 1976. In January 2013, Shine had bought a small legal firm representing people impacted by CSG in Queensland. The founder of Shine Lawyers, Kerry Shine, was born in Toowoomba. He became a member of the Queensland legislative assembly representing Toowoomba North, and Attorney-General of Queensland. Stanley Jones was a judge whilst Dr Levy was director-general of the Queensland Department of Justice under Shine. Shine was the Attorney-General for Premier’s Beattie and Bligh during the planning phase for east coast CSG-LNG export. From where I sat in 2010, it was like a military operation. Although Labor performed the sign-off, the planning was penned during the Howard/Downer LNP innings. Penelope “Penny” Wensley, who was born in Toowoomba, acted as Governor of Queensland during the LNG industry entry phase. A quick merger of the Queensland Liberal and National parties in 2008, designed by LNP president Bruce McIver and aided by Barry O’Sullivan, paved the way for a gas field invasion across the rural landscape, as impacted landholders had lost their political voice via the Nationals. Meanwhile, the general public were kept in the dark. There’d been no referendum on becoming a petro-state. At a federal Senate Inquiry chaired by former Queensland Senator Glenn Lazarus in late 2014, Senators Matthew Canavan and James McGrath heard evidence of assessment failures and multi-billion dollar losses to the manufacturing sector. McGrath’s presence at the hearing isn’t noted in the online transcript, however is found on the PDF version. Senator Barry O’Sullivanattempted to disrupt previous proceedings. LNP Senators O’Sullivan, Canavan and McGrath have Toowoomba connections, yet failed to attend the hearing in Toowoomba to hear of losses to regional agriculture, suffered by farmers like Joe Hill or the late George Bender and his wife Pam. Barry O’Sullivan was the director of Jilbridge Pty Ltd and NewLands Group Pty Ltd; laying the foundations for CSG infrastructure across the region. Contracts included Origin’s upstream APLNG project, and the intersection to the main entrance of the controversial Wagner’s airport. The company, now under his son’s directorship, also services the Queensland and Northern Territory governments. Senator McGrath’s Statement of Registrable Interests reveals he was contracted to Santos GLNG and KPMG in the period September 2013 to 30 June 2014, i.e. after election to the Senate but before his maiden speech. The Courier Mail mislead the public regarding the Lazarus 2014 inquiry, and discredited me, by printing my photo and reporting that no evidence of corruption had been provided. However, the Committee had had an impromptu meeting and I was told my evidence had to be given behind closed doors “in camera”. The newspaper’s photographer had taken my photo prior to the room being cleared. My testimony to the Lazarus 2014 inquiry was withheld by certain members until after a news article in a Sydney paper on 1 March 2015. In the interim, Ian Fletcher resigned from his post-Queensland position as New Zealand’s chief spy. The matters have not been investigated. Around the time Royal Dutch Shell acquired BG Group in February 2016, I was drafting submissions to two more federal Senate Inquiries; both ended by Prime Minister Turnbull with the announcement of an early election. Senator O’Sullivan now sits on the (re-structured) Senate Select Committee into a National Integrity Commission (2017). In the Parliamentary library can be found a background note by Michael Priestly , of the economics section, dated 16 December 2009. Priestly reveals that on 12 May 2009 (i.e. one year before Fletcher’s email to the Queensland Treasurer) a Project Development Agreement was made between BG Group and China National Offshore Oil (CNOOC) Ltd for the supply of 3.6 mtpa of LNG, for 20 years, from the startup of QCLNG. The Agreement was made prior to Fletcher’s 2009 appointment to the position of director-general of Queensland’s mega department DEEDI, and prior to the signing ceremony on the stage in Beijing in March 2010. Does this 10 per cent discount account for the failure to implement domestic gas protections outlined in the Queensland government’s 2009 Blueprint? “Reservation commitment should be applied to both reserves and production; domestic gas should be supplied no later than LNG start-up and not unduly delayed. Domestic gas obligations should be made unconditional and not subject to “commerciality” escape clause. Domestic supply should increase with any future expansion in gas reserves or LNG exports. For unknown reasons, the DomGas recommendations appear to have been ignored. 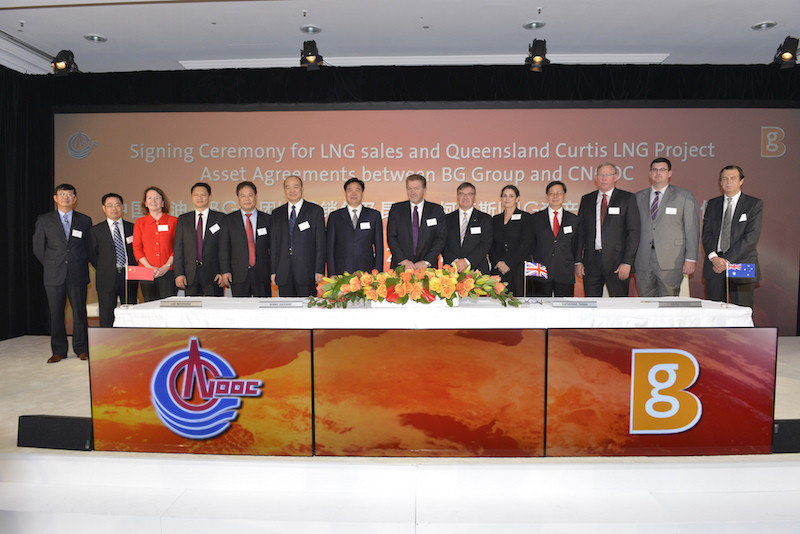 BG Group-CNOOC signing ceremony, Brisbane 6 May 2013 showing Newman Government’s Jeff Seeney in photo. In conclusion, it is painfully obvious that Parliament must end the gas-mining mob’s coup. If Parliament is incapable, then the Governor-General should exercise reserve powers. Either way, the cabal’s access to our systems must be shut down; its thieving monopoly ended; its mafia and media destroyed. CSG-LNG is unsustainable. It’s a virus. Simone Marsh was a senior environmental analyst with the Queensland Co-ordinator General. After filing her report on the environmental effects of the proposed LNG industry in June 2010, she walked out of her job and was not heard of again in the media until she testified as a whistleblower at the Queensland government parliamentary inquiry into Queensland government administration of Commonwealth government affairs in November 2014.